Passover is around the corner and while I usually resort to custards, sorbets and ice creams, this past week I baked a Peanut Apple Cake to rave reviews. Originally a cardamon Apple Almond Cake recipe from Gourmet. I subbed peanuts for the almonds as we are allergic to tree nuts. I also used 1 teaspoon vanilla for the cardamon though I absolutely love the spice. I also whipped the eggs yolks and egg whites as instructed in the directions, incorporated egg whites and yolks, and only then added the matzo meal dry mix into wet mix folding it gently in a few batches to make the cake batter. On a personal note. I have been MIA recently. I am torn and miss you and posting here. Life has been super hectic with Spring here, personal and professional projects and S is back on Spring break with his British roommate. I do pause and make them pancakes the mornings when they are here and not visiting friends overnight. 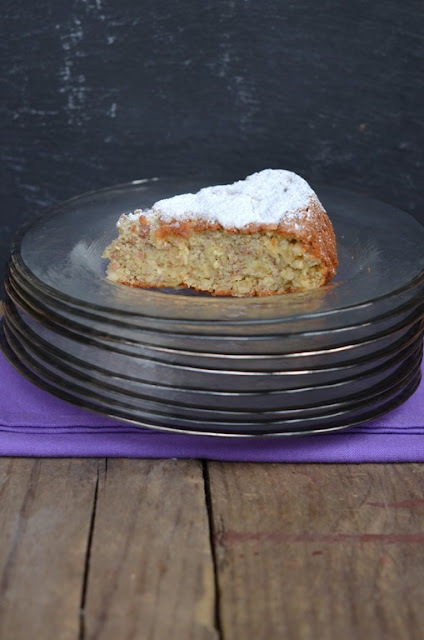 Shulie, this apple peanut passover cake looks scrumptious! Happy Passover! Look like just the thing to enjoy with a nice cup of tea! I am going to try this for sure! I have some Passover desserts at my site today too! Aw let me know when you do. I will head over to check your Passover desserts. Happy Passover! wow the apple and peanut combo sounds delicious! i've been a bit MIA too b/c of life happening here. Hi Junia. Missing you but good that you live life and in the moment & thx! You are welcome and my pleasure!